Everyone knows that pregnant women are meant to have the luxury of eating what they want when they want. But if you've being following a calorie-controlled diet in an attempt to lose weight, nutrition during pregnancy could become a confusing issue. Here are some tips on what to eat and how many calories to aim for during 3 key stages of baby-making. While trying for a baby you should pay more attention to eating healthily as this will improve your overall nutritional status, and therefore your hormones and ability to get pregnant. You should include whole grains, a wide variety of fruit and vegetables, a couple of lean protein portions daily (including one oily fish portion a week), three daily servings of dairy or calcium-rich foods and some healthy fats such as nuts, seeds, avocados, or olive oils. Start taking a daily supplement of 400 micrograms of folic acid, cut down on caffeine and limit your alcohol intake to no more than a glass or two a couple of times a week. 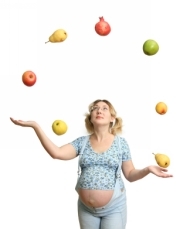 The official line is that dieting during pregnancy is potentially hazardous to you and your developing baby. Women who eat well and gain the appropriate amount of weight are more likely to have healthy babies. But the key is 'an appropriate amount of weight' which can be very individual. As a general rule you should not have less than 1800 calories during the first two trimesters of pregnancy and not go below 2000 calories in the final three months. You'll still gain weight, but hopefully a minimal amount and after the baby is born you should be no heavier and probably lighter. Ask your GP and midwife for more detailed personal advice, and keep eating healthily. Hurrah for breast-feeding because it really helps you get in shape! Breast-feeding can use between 250-500 calories a day which will help shed baby-weight. A breast-feeding mum should never go lower than 1800 calories a day, and try to pack as much nutrition into those 1800 calories as possible because this can be a draining time. So that's plenty of fruit and vegetables, low fat dairy products, lean meat and fish, energizing carbs and not too many empty calories (i.e. fatty sugary foods).